What would be your best ROAD TRIP song? It was an epic week, we covered a lot of ground on our road trip to Alberta. 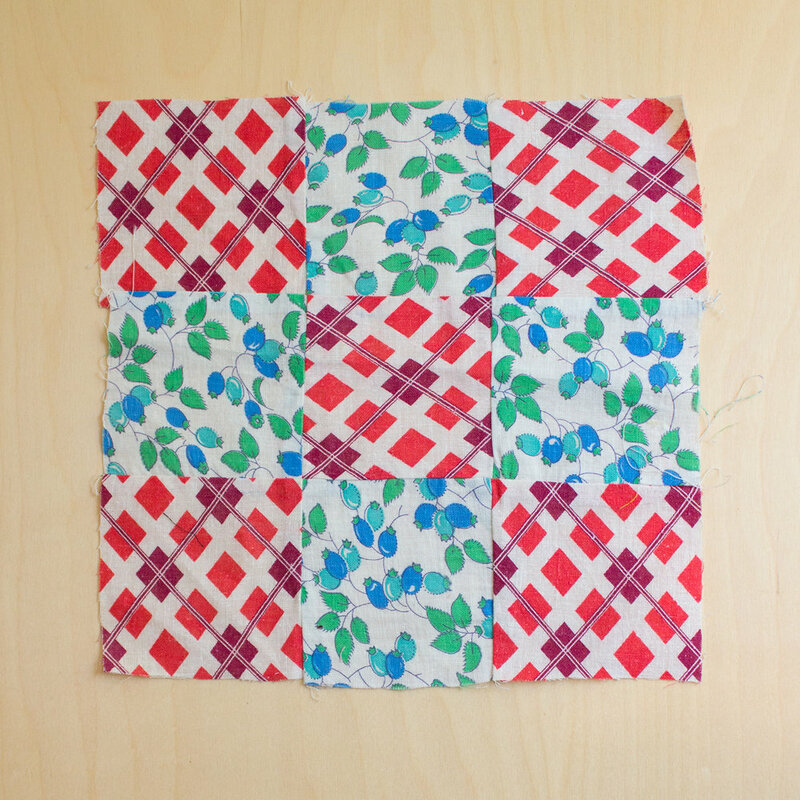 Less hand sewing happened than I had hoped but lots of reading. 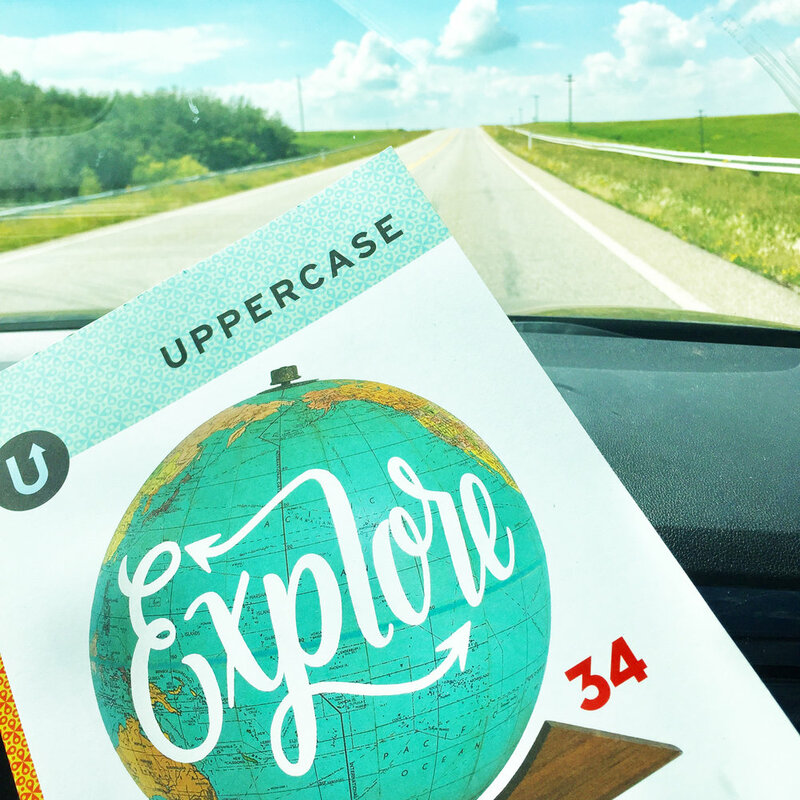 I brought along the latest issue of Uppercase magazine (appropriately titled). I also brought along my Uppercase Feed Sacks book. It's part of an Encyclopedia set that Uppercase is publishing. 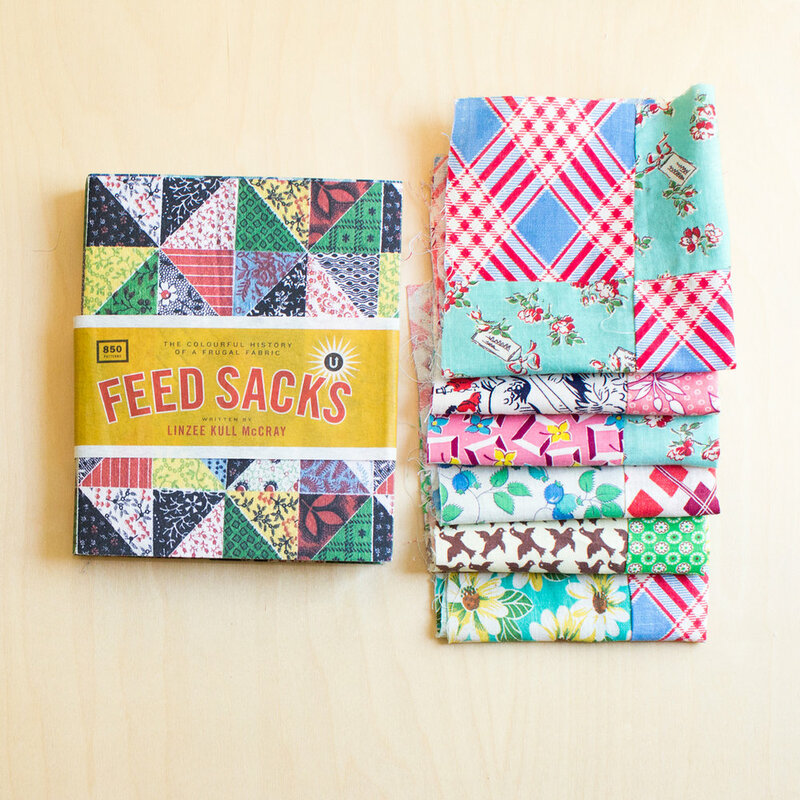 Which reminded me of the feed sack blocks I bought from a lovely couple when I was at Quilt Markets this past spring, Carolyn and Don Springer. Gosh they were sweet (notice the book on their counter). Speaking of shopping, I picked up a copy of Kathleen Riggens, Diary of a Swirl when I was at the Sewing Center in Camrose. I also had this plan, if I only bought fat quarters, I wouldn't buy/spend as much. WRONG. Oh my god so wrong. <hand smack to forehead>. 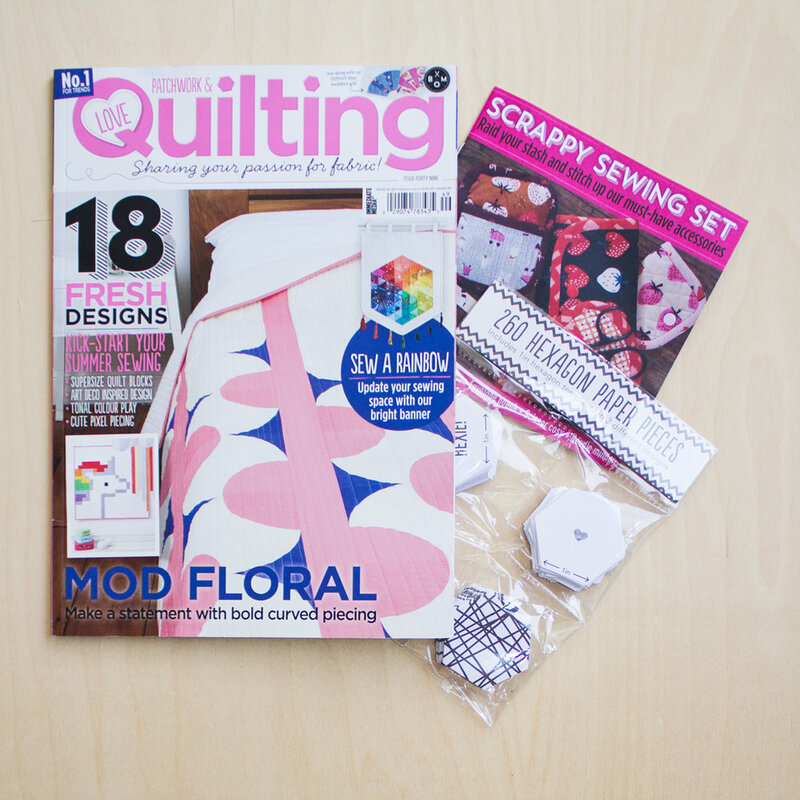 I also stopped in to Chapters at West Edmonton Mall and found a Love Patchwork and Quilting magazine! They can be so hard to find since they carry only two copies at a time. I was very tickled to see Kerry Goulder's spread! Plus Felice Regina's AND Lindsey Neil's projects! I'm such a fan girl! These ladies have it GOIN' on! BUT definitely a highlight of my trip was meeting up with my high school textiles teacher (I'm not going to lie, it was so weird calling her by her first name). I adore this lady, Karen (yep, still weird!). Her class was my happy place and her encouragement went a long, long way! Teachers out there... you do amazing work and it stays with us for the rest of our lives! Don't get me wrong, stay in school kids but I'd argue, for me Textiles (and art class) were the most important classes. My husband is in the photo too he went to the same school! Our own little reunion! So there you have it, all wrapped up in a nutshell. The whole trip. And of course we listened to A lot of music. I found this 50 best road trip article. I don't think I'd say their number one track would be my choice. Mine would be a tie between Johnny Cash's I've Been Everywhere, Cyndi Lauper's I Drove All Night (does she age? ), Cake's The Distance and Ray Charles's Hit the Road Jack. Which I oddly associate with Shake your Booty... I'm not sure why. As a kid I thought they said boobie which to me was was HI-larry-ous! And if I was really honest, I still do!